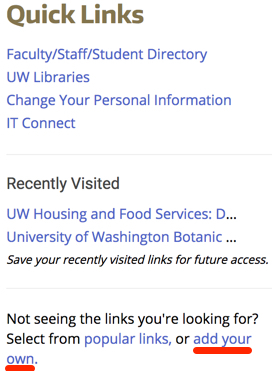 Quick Links, on the right side of the MyUW home page, displays a short list of important links based on your affiliation (e.g. student, employee.) You can also add links to your Quick Links by selecting sites you’ve recently visited, popular links, or adding your own custom link. Learn how to personalize your Quick Links. Before you begin, open both versions of MyUW in two browser tabs. You will switch back and forth between these tabs, copying the old link from the legacy MyUW, and pasting the link into the appropriate area in the new MyUW. From within the legacy MyUW, right-click the bookmark and click Copy Link Address (or Location). Go to the tab where you have opened the new MyUW: http://my.uw.edu/choose/new. On the right side of the home page, under Quick Links, click add your own. A text field will open. Under Add your link to Quick Links, paste the URL of your bookmark and then click Save. Your bookmark will appear at the bottom of the list of Quick Links. You can edit the URL to change it to a friendly name.